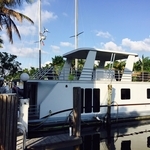 I own a property management company specializing in yacht and houseboat rentals. I love the water and enjoy sailing every chance I get! I carefully select the listings I represent, so you can be assured you are staying in a property I have stayed in and am confident you will enjoy. I enjoy hosting vacation rental travelers as you are the most adventurous, interesting folks I have had the pleasure to rent to. I look forward to welcoming you aboard!